← Deal Of The Day, 2700cc Gen. 2 Engine, w/rear alt. and HD oil sys. 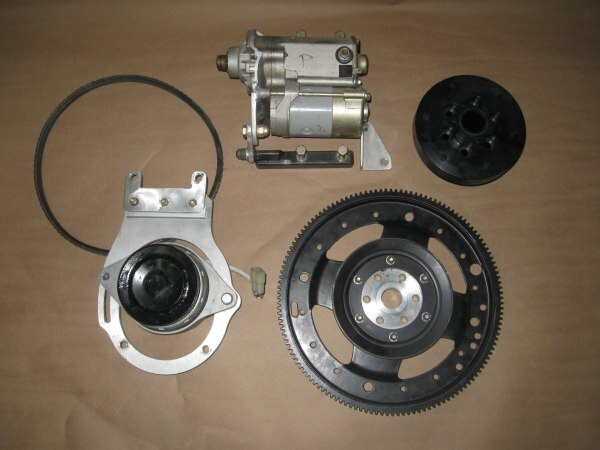 Today’s deal of the day is an early generation black hub / starter and alternator arrangement. These parts actually flew on our Zenith 601XL in 2004. They have been used on another test engine. The parts are used, but in fairly good condition and airworthy. Before there were Gold hubs and 5th bearings, this was how Corvairs were converted. Today, there are still a great number of aircraft in the Corvair fleet operating systems identical to these. This set up can be directly used on a 4 bearing engine, or it can be used by a builder using a Gen. 1 Dan Weseman bearing. If a budget minded builder wanted to use this with a 5th bearing, it would require the hub modification and a switch to gold starter brackets. It would still be an economical proposition. The ring gear is an FRA-235, the style we have not used in 5 years. Today we use disc style ring gears that do not have spokes. If the edges of the spokes above are polished to remove stress risers, they have a good track record. Otherwise they are prone to developing cracks in the spokes. I put a lot of effort into explaining the concept and asking people to periodically inspect these, but many builders did neither. Today, all of these are eliminated by only offering the disc style ring gear, but for builders willing to put closer effort in, the spoked wheels was more than a pound lighter. If a builder wanted to upgrade to a disc style ring gear on this arrangement, it will bolt right on. This is a good opportunity for a builder working to a tight budget to get launched on an affordable engine. Black hub, Ring gear, puck, front alternator pulley, starter, brackets, tail bracket, alternator brackets, 20 amp alternator, and drive belt. These parts cost more than $1,250 new. As the ‘Deal of the day’, we are selling them for $475. I will cover the shipping in the US.-ww.